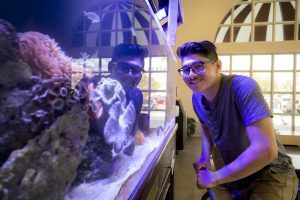 Panther Dining Hall (PDH) is home to a 240-gallon reef aquarium maintained by Florida Tech’s Oceanography Program and supervised by Professor Kevin B. Johnson. 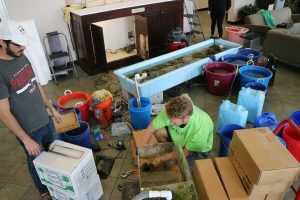 Under his guidance, a team of oceanography and ocean engineering students, with occasional help from aquaculture and marine biology students, maintain the tank. This spring, the main 8-foot tank was replaced and the entire system revitalized—adding more hard coral and new fish. The effort took a month in planning and a full day to implement. More than a dozen students studying marine biology, environmental science, oceanography and ocean engineering participated in the project—keeping the livestock stress-free and correctly timing the seawater delivery with the mounting of the new aquarium. The aquascape is comprised of approximately 240 lbs. of sand and 250 lbs. of rock—much of it generously donated by CaribSea, a leading aquarium supply company. The fish and invertebrates eat a conglomerate of copepods and other zooplankton, mysid shrimp, flake foods and seaweed or romaine lettuce for the omnivores. Maintaining the PDH aquarium takes a great deal of patience and hard work. The staff works Monday through Friday with the occasional weekend shift to clean the tank, feed the fish and invertebrates, monitor the water quality and keep health records on the inhabitants. Thank you to all our aquarium student-staffers who keep our reef healthy.